If you, as a Chief Executive Officer, engage either a PR or Advertising agency without understanding what value they can offer your company, you risk being disappointed in the end result (not to mention you will have invested time and money into achieving the wrong goal). You may be subject to verbal abuse and hostile body language if you liken PR to Advertising in front of a PR practitioner or vice versa (this would be an awkward situation if you deal with this person regularly or if you are in a public setting – or both). If you would prefer to avoid both of the above undesirable circumstances, I recommend you read on. 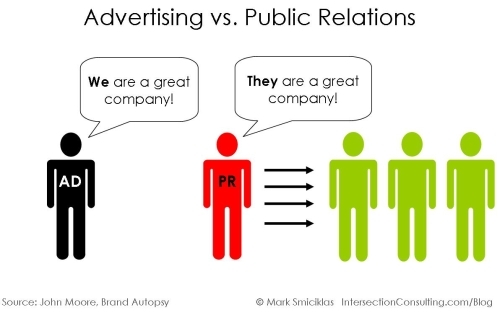 I’ve listed a few points below outlining the key differences between PR and Advertising to make sure you know your apples from oranges. Keep in mind the points below are just the top of the fruit bowl! 1. Paid space vs Free coverage Advertising is paid placement. This means the company pays to put their ad in a particular space or time slot, whether this be for television, the newspaper or the radio. PR is all about free media exposure for the company using media releases, events, social media and press conferences (to name a few). An interesting article addressing the effectiveness of PR campaigns (written by CP Communications Director Catriona Pollard) actually highlights that PR can have up to 10 times the impact of traditional, paid advertising! 2. Big Bad Advertising Wolf vs Little Red Riding Hood If we were confronted by Little Red Riding Hood and the Big Bad Wolf on two separate occasions, we would probably believe Little Red’s story over the Wolf’s. Well unfortunately Advertising is the Wolf in this scenario. When consumers see an advertisement, they perceive it to be biased considering the company usually just wants to sell them something. As a result, they are less likely to believe the company (or their product) are as fabulous as they say they are. (like a media outlet) albeit endorsing the topic being communicated. In the eyes of the public, this increases the credibility of the information being communicated. 3. Total vs No control Considering a company pays precious money for ad space, they are given complete control over the message. They can choose the exact content, the size of the advertisement or the time slot it appears in, the design, and all the other relevant elements. In PR there is no control over how the media presents the message. Once they have it they can leave it as it is, cut it down, rework it or simply ignore it. They are not obligated to use the information you sent them (EVEN if your email was accompanied by a smiley face emoticon). And this is never more present than with social media and the lack of control over message dissemination. 4. Low vs High priority Don’t look for your ad on the front page of the newspaper because you won’t find it. News takes priority – which pretty much means PR (aka NEWS) trumps advertising any day! GOT IT? Now it’s time to get out there, sort the apples from the oranges, and decide which one can offer YOUR business the most value (as a PR practitioner, you all know my answer).